Our coconut shrimp recipe is a tropical delight. Imagine prawns simmering in our sauce containing diced onion, fresh garlic, mushrooms, pineapple, savory spices, and coconut milk. Served over a bed of coconut rice. The flavors are subtle yet rich and tropical. You will think you are in paradise. This is a fairly quick dish to put together. Just make sure you defrost your shrimp in the refrigerator the night before. If not, you can do a quick defrost by running them through cold water. I remove the shells and tails before cooking. I think it is so much nicer having the tails removed so you can get down to eating instead of having to remove them once this wonderful dish is in front of you. I like to buy my shrimp at Costco. You can use either the 21 to 31 count or 31 to 40 count. I like to use the larger shrimp. Just figure about 8 to 10 shrimps apiece. When you cook the rice, keep the flame low as it will want to stick and even burn a little because the coconut milk is in there. Not much you can do about it. Just know that it may happen. I purchase my coconut milk from Trader Joe’s as they have a lite version which has less fat. Dice the onion and mushrooms nice and small so they distribute well throughout the recipe. This dish cooks up rather quickly so you can get a nice dinner on the table in no time. 1 and 1/2 lbs. of tiger shrimp, about 30 to a lb. Start by cooking the coconut rice as it will take the longest. Follow the directions on the package just substitute the chicken broth and 1 1/2 cups of coconut milk for the water and add 1 tsp. salt. Keep warm. Add 2 Tbsp. oil to a large frying pan over medium heat. Saute the onion and mushrooms for 10 minutes or until the onion is soft and translucent. Add the garlic and cook 2 minutes longer, stirring frequently. Turn the heat up to high and add a tsp of oil to the pan. Then add the shrimp and wine. Cook the shrimp for about 1 minute turning shirmp over after 30 seconds. Lower the heat to medium and add the onion mixture, coconut milk, chile powder, pineapple (with a little of the juice), and 1/2 tsp of salt or to taste. Add a little pepper too. Stir well and heat through about 5 minutes. Once it’s hot it’s ready to serve. 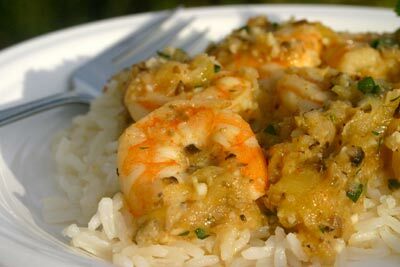 To serve our coconut shrimp recipe, spoon out some coconut rice on a warmed plate and top with the shrimp mixture. Garnish with a sprinkle of chopped parsley or cilantro and enjoy.